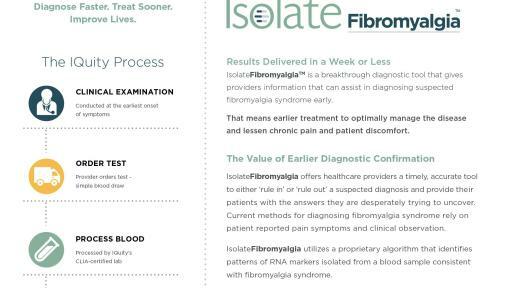 NASHVILLE, Tenn., March 7, 2018 – Nashville-based data science company IQuity has announced the release of IsolateFibromyalgia™, a pioneering blood test that uses RNA analysis to help health care providers accurately and quickly detect fibromyalgia syndrome. IsolateFibromyalgia uses a simple blood draw to detect, with 94 percent accuracy, if a patient’s gene expression pattern is consistent with fibromyalgia syndrome. The extensive disease controls used in the creation of IsolateFibromyalgia make the test highly accurate in differentiating fibromyalgia from conditions that it mimics or that could be misdiagnosed as fibromyalgia. IQuity’s researchers examined approximately 600 samples from patients suffering from a number of conditions, including fibromyalgia, rheumatoid arthritis, systemic lupus and clinically diagnosed depression, as well as healthy patients. See how the process works. 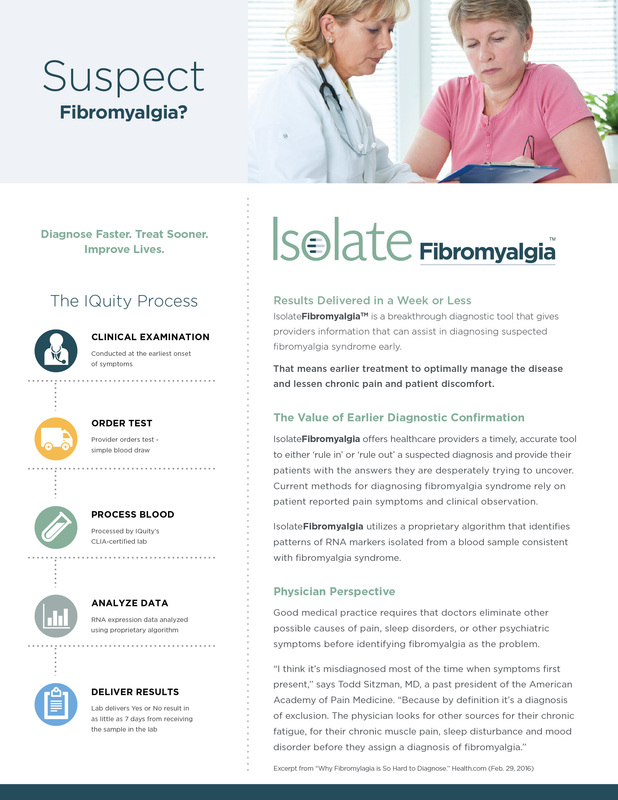 Providers who suspect fibromyalgia in a patient can order the test at IQuityLabs.com, with results delivered back to the provider within seven days of receiving the sample in the laboratory — reducing by months and even years the time it currently takes to diagnose the disease. Fibromyalgia is a central nervous system disorder that affects between 6 and 12 million Americans, according to the American Chronic Pain Association. Its symptoms vary among patients, but many struggle with intense pain throughout the body, as well as fatigue, depression and difficulty concentrating. IQuity has previously released two other tests: IsolateMS™, for multiple sclerosis, and IsolateIBS-IBD™, for irritable bowel syndrome (IBS) and inflammatory bowel disease (IBD), which includes Crohn’s disease and ulcerative colitis. All three tests were developed using the proprietary IQIsolate™ technology, which applies machine-learning methods to create a suite of algorithms that compares the RNA profile from patient blood samples against a robust data set of healthy and sick patients identified through IQuity’s research. IQuity, Inc. is a data science company using genomic and proprietary healthcare datasets to detect and monitor chronic disease. IQuity has developed game-changing blood tests using RNA data (genomic) to accurately detect autoimmune disease in its early stages. The application of data science and machine learning is at the core of the business and drives technological development. For more information on our tests, visit iquitylabs.com and find us on Facebook and Twitter at @iquityinc.